آخرتی ثانی, سید رضا, مرتضایی, مهرزاد, امیری امرای, ایرج. (1395). تأثیر دمای پخت بر انرژی شکست اپوکسی پرشده با نانوذرات سیلیکا با ابعاد مختلف. علوم و فناوری کامپوزیت, 3(4), 389-396. سید رضا آخرتی ثانی; مهرزاد مرتضایی; ایرج امیری امرای. "تأثیر دمای پخت بر انرژی شکست اپوکسی پرشده با نانوذرات سیلیکا با ابعاد مختلف". علوم و فناوری کامپوزیت, 3, 4, 1395, 389-396. آخرتی ثانی, سید رضا, مرتضایی, مهرزاد, امیری امرای, ایرج. (1395). 'تأثیر دمای پخت بر انرژی شکست اپوکسی پرشده با نانوذرات سیلیکا با ابعاد مختلف', علوم و فناوری کامپوزیت, 3(4), pp. 389-396. آخرتی ثانی, سید رضا, مرتضایی, مهرزاد, امیری امرای, ایرج. تأثیر دمای پخت بر انرژی شکست اپوکسی پرشده با نانوذرات سیلیکا با ابعاد مختلف. علوم و فناوری کامپوزیت, 1395; 3(4): 389-396. معمولا با افزایش دما، پخت اپوکسی کامل‌تر انجام می‌شود و مدول و استحکام کششی نیز افزایش می‌یابد اما به‌دلیل اتصالات عرضی زیاد، پلیمر ترد شده و چقرمگی شکست آن کاهش می‌یابد. در این پژوهش، به‌منظور افزایش چقرمگی شکست، از تکنیک کاهش دمای پخت استفاده شده و نانوذرات سیلیکا در اندازه‌های مختلف، برای جلوگیری از کاهش استحکام به اپوکسی اضافه شد. به‌منظور مطالعه اثر دما، نمونه‌های اپوکسی با کسر حجمی‌های مختلف از نانوذرات سیلیکا، در دو دمای پخت 105 و C°90 تهیه شده و میزان چقرمگی شکست، استحکام و مدول کششی آن‌ها توسط آزمون‌های مکانیکی اندازه‌گیری شد. در نمونه‌های فاقد نانوذرات، با کاهش دمای پخت، افزایش قابل توجه در چقرمگی شکست مشاهده شد اما مدول کششی و استحکام نمونه، به‌دلیل پخت ناقص اپوکسی، کاهش یافت. اما در نمونه‌های حاوی نانوذرات سیلیکا، تقویت‌کنندگی نانوذرات بر نقص پخت غلبه کرده و برآیند دو مکانیزم موجب افزایش استحکام و مدول کششی شد. در عین حال افزایش چقرمگی و انرژی شکست، نشان از هم‌افزایی قابل قبول تکنیک‌های پخت ناقص و حضور نانوذرات سیلیکا در کامپوزیت، دارد. هر چند چقرمگی شکست نمونه‌های پخت شده در دمای C°90 همواره از نمونه‌های پخت شده در دمای C°105 بیشتر است اما با افزایش سطح نانوذرات سیلیکا (کاهش اندازه نانوذرات) نقش نانوذرات غالب بوده و تفاوت متأثر از دمای پخت کمتر می‌شود. محاسبات نشان داد مکانیزم‌های تغییر شکل پلاستیک، گسترش حباب و شکسته‌شدن کلوخه‌ها، نقش اصلی را در افزایش چقرمگی شکست داشته و تحت تاثیر یکدیگر تشدید می‌شوند. Epoxy toughening is very important in industry, because high brittleness and low fracture energy. In this work different toughening techniques was used for epoxy curing system. The techniques include change of the curing temperature and simultaneous addition of silica nanoparticles on curing system. The glass transition temperature of epoxy with this curing system is approximately 118 , if the curing temperature is too closer to glass transition temperature then curing is complete, So tensile modulus and other properties such as strength is increased; In this work curing temperature was changed from 105 to 90 . While it was just pure epoxy to be tested, tensile modulus decrease and fracture energy increases, as result imperfect curing at 90 . But addition of nano-particles to the curing system increased tensile modulus in both temperatures curing system, this increased in both curing system is equal while the equal nominal surface of the nanoparticles used. On the other hand toughness and fracture energy in both curing system increased with increased nominal surface of nanoparticles when nanosilica is used, this raise in the fracture toughness at curing temperature of 90 is always greater than from the fracture toughness at curing temperature of 105 . In generally seen curing at 90 and increase in the nominal surface of nano- particles which were strongly increased fracture toughness, and modulus. The fundamental mechanisms that are effective in increasing the toughness of nano composites, they are used to analyzing the increase in fracture toughness of nanocomposites. Xu, S.A. Wang, G.T. and Mai, Y.W., “Effect Of Hybridization Of Liquid Rubber And Nanosilica Particles on the Morphology, Mechanical Properties, and Fracture Toughness of Epoxy Composites,” Journal of Materials Science, Vol. 48, No. 9, pp.3546-3556, 2013. Hsieh, T.H. Kilanch, A.J. Taylor, A.C. Sprenger, S., “The Effect Of Silica Nanoparticles And Carbon Nanotubes On The Toughness Of A Thermosetting Epoxy Polymer,” Journal of Applied Polymer Science, Vol. 119, No. 4, pp. 2135-2142, 2011. Tang, L.C. Wan, Y.J. Peng, K. Pei, Y.B. Wu, L.B. Chen, L.M. Shu, L.J. Jiang, J.X. Lai, G.Q., “Fracture toughness and electrical conductivityof epoxy composites filled with carbon nanotubes and spherical particle, ” Composites Part A: Applied Science and Manufacturing,. Vol. 45, pp. 95-101, 2013. Johnsen, B. Kinloch, A. Mohammed, R. Taylor, A. Sprenger, S., “Toughening Mechanisms Of Nanoparticle-Modified Epoxy Polymers,” Polymer, Vol. 48, No. 13, pp. 530-541, 2007. Wetzel, B.R.P. Haupert, F. Friedich, K., “Epoxy Nanocomposites Fracture Andtoughening Mechanisms. Engineering Fracture Mechanics,” Journal of engineering Fracture Mechanics, Vol 73, No, 6, pp. 2376-2398, 2006. Kim, J.A. Seong, D.G. Kang, T.J. Youn, J.R., “Effects Of Surface Modification On Rheological And Mechanical Properties Of CNT/Epoxy Composites,” Carbon, Vol. 44, No. 10, pp.1898-1905, 2006. Singh, R. Zhang, M. and Chan, D., “Toughening Of A Brittle Thermosetting Polymer: Effects Of Reinforcement Particle Size And Volume Fraction,” Journal of Materials Science, Vol. 37, No. 4, pp. 781-788, 2002. Gong, X. Liu, J. Baskaran, S. Voise, R. D. Yang, J. S., “Surfactant-Assisted Processing Of Carbon Nanotube/Polymer Composites,” Chemistry of Materials, Vol. 12, No. 4, pp. 1049-1052, 2000. Gam, K.T., “Structure-Property Relationship In Core-Shell Rubber Toughened Epoxy Nanocomposites,”second ed., Texas A&M University, Waterloo, pp. 83 - 140, 2003. Garg, A.C. and Mai, Y.W., “Failure Mechanisms In Toughened Epoxy Resins—a Review,” Composites Science and Technology, Vol. 31, No. 3, pp. 179-223, 1988. Moloney, A. Kausch, H. and Stieger, H., “The Fractureof Particulate-Filled Epoxide Resins,” Journal of Materials Science,Vol. 18, No. 1, pp. 208-216, 1983. Faber, K.E.A., “Crack Deflection Processes,Theory,” Acta Metallurgica, Vol. 4, pp. 565-576, 1983. Evans, A., “The Strength Of Brittle Materials Containing Secondphase Dispersions,” Philosophical Magazine, Vol. 26, No. 6, pp. 1327-1344, 1972. Zheng, Y. Chonung, K. Wang, G. Wei, P. and Jiang, P., “Epoxy/Nano‐Silica Composites: Curing Kinetics, Glass Transition Temperatures, Dielectric, And Thermal–Mechanical Performances,” Journal Of Applied Polymer Science, Vol. 2, No. 111, pp. 917-927, 2009. Liang, Y. and Pearson, R., “Toughening Mechanisms In Epoxy–Silica Nanocomposites (ESNs), ” Polymer, Vol. 50, No. 20, pp. 4895-4905, 2009. Xu, Y. and Hoa. S.H., “Mechanical Properties Of Carbon Fiber Reinforced Epoxy/Clay Nanocomposite,”, Composites Science and Technology, Vol. 68, No. 3, pp. 854-861, 2008. Hsieh, T.H. Kinloch, A.J. Taylor, A.C. and Kinloch, I.A., “The Effect Of Carbon Nanotubes On The Fracture Toughness And Fatigue Performance Of A Thermosetting Epoxy Polymer,” Journal Of Materials Science, Vol. 46, No. 23, pp.7525-7535, 2011. Ou, C.F. and M.C. Shiu., “Epoxy Composites Reinforced By Different Size Silica Nanoparticles,” Journal Of Applied Polymer Science, Vol. 115, No. 5, pp. 2648-2653, 2010. Mirmohseni, A. and Zavareh. S., “Epoxy/Acrylonitrile-Butadiene-Styrene Copolymer/Clay Ternary Nanocomposite As Impact Toughened Epoxy,” Journal Of Polymer Research, Vol. 17, No. 2, pp. 191-201, 2010. Tang, Y. Ye, L. Zhang, D. and Deng, S., “Characterization Of Transverse Tensile, Interlaminar Shear And Interlaminate Fracture In CF/EP Laminates With 10wt% And 20wt% Silica Nanoparticles In Matrix Resins,” Composites Part A: Applied Science and Manufacturing, Vol. 42, No. 12, pp. 1943-1950, 2011. Zamanian, M. Mortezaei, M. Salehnia, B. and Jam, J.E., “Fracture Toughness Of Epoxy Polymer Modified With Nanosilica Particles: Particle Size Effect,” Engineering Fracture Mechanics, Vol 97, pp. 193-206, 2013. Dittanet, P. and Pearson. R.A., “Effect Of Bimodal Particle Size Distributions On The Toughening Mechanisms In Silica Nanoparticle Filled Epoxy Resin,” Polymer, Vol. 54, No. 7, pp. 1832-1845, 2013. Zappalorto, M. Salviato, M. and Quaresimin, M., “Mechanical Behaviour Of Epoxy/Silica Nanocomposites: Experiments And Modelling,” Composites Part A: Applied Science and Manufacturing, Vol. 72, pp. 58-64, 2015. Dittanet, P. and Pearson. R. A., “Effect of silica nanoparticle size on toughening mechanisms of filled epoxy, ” Polymer, Vol. 53, No. 9, pp. 1890-1905, 2012. Johnsen, B.B. Kinloch, A.J. Mohammed, R.D. Taylor, A.C. and Spewnger, S., “Toughening Mechanisms Of Nanoparticle-Modified Epoxy Polymers,” Polymer, Vol. 48, No. 2, pp. 530-541, 2007. Bray, D. Dittanet, P. Guild, F.J. Kinloch, A.J. Masania, K. Pearson, R.A. Taylor, A.C., “The Modelling Of The Toughening Of Epoxy Polymers Via Silica Nanoparticles: The Effects Of Volume Fraction And Particle Size,” Polymer, Vol. 54, No. 26, pp. 7022-7032, 2013. Luo, Z. Cai, X. Hong, R.Y. Wang, L.S. and Feng, W.G., “Preparation Of Silica Nanoparticles Using Silicon Tetrachloride For Reinforcement Of PU,” Chemical Engineering Journal, Vol. 187, pp. 357-366, 2012. 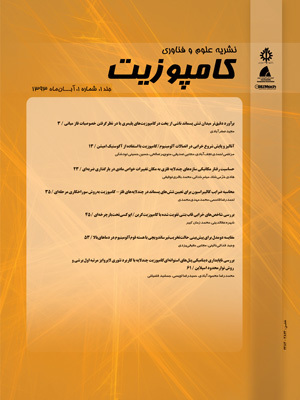 Khalafi, H. Mortezaei, M. and Amiri, I., “Modeling Of Degree Of Cure In Epoxy-Glass Prepreg, ”In Persian, Journal of Science and Technology of Composites, Vol. 1, No. 2, pp.43-48, 2015. Zhang, H. Tang, L.C. Zhong, Zh. Friedrich, K. and Sprenger, S., “Fracture Behaviours Of In Situ Silica Nanoparticle-Filled Epoxy At Different Temperatures,” Polymer, Vol. 49, No. 17, pp. 3816-3825, 2008. Hull, D., “Fractography: Observing, Measuring And Interpreting Fracture Surface Topography,” Third ed., Cambridge University Press, New York, pp 157-201, 1999. Kourki, H. Mortezaei. M. and Famili. M.H.N., “Filler networking in the highly nanofilled systems, ” Journal of Thermoplastic Composite Materials, Vol. 1, pp. 1-17, 2014. Hsieh, TH. Kinloch, A.J. Masania, K. Taylor, A.C. and Sprenger, S., “The Mechanisms And Mechanics Of The Toughening Of Epoxy Polymers Modified With Silica Nanoparticles,” Polymer, Vol. 51, No. 26, pp. 6284-6294, 2010. Liang, Y. and Pearson. R.A., “The Toughening Mechanism In Hybrid Epoxy-Silica-Rubber Nanocomposites (HESRNs),” Polymer, Vol. 51, No. 21, pp. 4880-4890, 2010. Hsieh, T.H. Kinloch, A.J. Masania, K. Lee, J.S. Taylor, A.C. and Sprenger, S., “The Toughness Of Epoxy Polymers And Fibre Composites Modified With Rubber Microparticles And Silica Nanoparticles,” Journal Of Materials Science, Vol. 45, No. 5, pp. 1193-1210, 2010. Kourki, H. Famili, M.H.N. Mortezaei, M. Malekipibazari, M. Disfani, M.N., “Highly Nanofilled Polystyrene Composite Thermal And Dynamic Behavior. Journal Of Elastomers And Plastics,” Journal of Elastomers & Plastic, Vol. 1, pp. 1-12, 2015. Kourki, H. Mortezaei, M. and Famili, M.H.N., “Prediction Of The Viscoelastic Response Of Filler Network In Highly Nanofilled Polymer Composites,” Journal Of Compusite Materials, Vol. 49, No. 30, pp. 3799-3807, 2015.